Hill's Prescription Diet Feline - Metabolic plus Urinary is clinically proven nutritional management suitable for cats with weight problems and which also suffer from FLUTD. 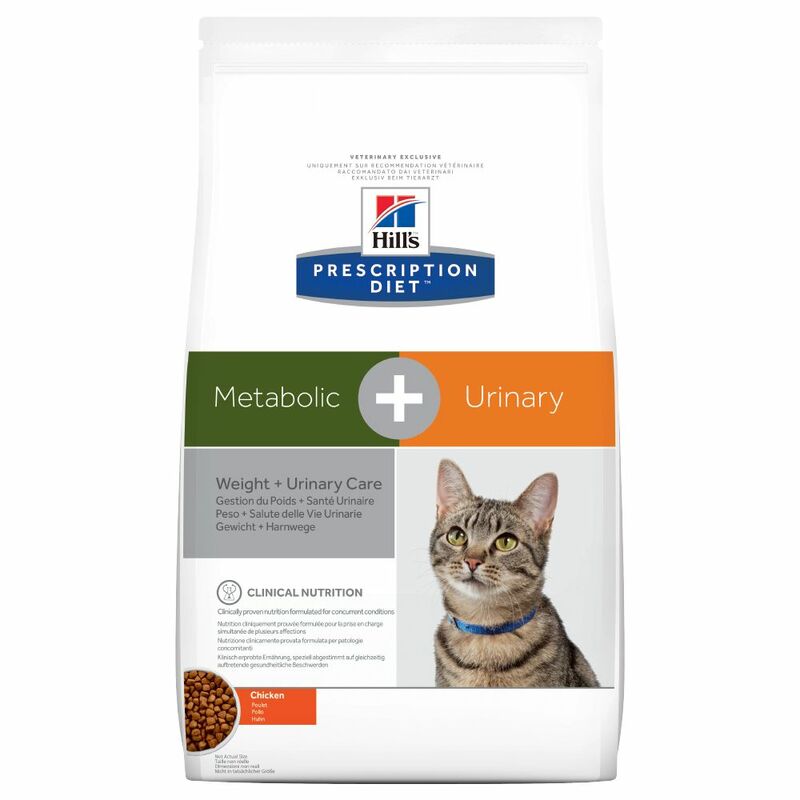 This weight and urinary care dry food has been formulated for concurrent conditions and can be used to help your cat lose weight or to help in maintain a healthy weight, as well as to support a healthy urinary tract. It can help to diΒolve struvite stones. This clinically proven dry cat food works naturally with your pet's unique energy use and activates the body's natural ability to burn fat. Struvite crystals and stones tend to occur when the urine is oversaturated with magnesium, ammonium and phosphorus and in combination with alkaline urine pH values. A controlled amount of phosphorus, magnesium and calcium helps to reduce the formation of bladder stones. Hill's Prescription Diet Feline - Metabolic plus Urinary is clinically proven to diΒolve struvite stones in as little as 7 days and to reduce body weight by 11% in 60 days. This kibble provides your cat with a tasty, balanced meal which helps your cat to feel full and satisfied for longer. Indications: Initial dietary management for cats with all forms of FLUTD (Feline Lower Urinary Tract Disease) including crystalluria and / or urolithiasis of any cause, urethra plus and idiopathic cystitis DiΒolving sterile struvite stones Long-term dietary management for cats with a tendency towards Struvite, calcium oxalate, calcium phosphate crystals ** and stones (reduction of occurrence and recurrence) Urethra plugs (almost exclusively aΒociated with struvite or calcium phosphate crystals) Feline idiopathic cystitis (FIC) Overweight and obese cats Weight maintenance after a weight loΒ Contraindications: Dogs Kittens Pregnant and lactating queens Hill's Prescription Diet Feline Metabolic plus Urinary at a glance: Clinically proven nutritional management: works naturally with your cat's unique energy use and activates the body's natural ability to burn fat Controlled amount of magnesium, calcium and phosphorus: helps to reduce the formation of bladder stones Clinically proven: to diΒolve struvite stones in only 7 days and to reduce body weight by 11% in 60 days Tasty and satisfying: a, balanced meal so your cat feels full and satisfied for longer Important antioxidants: help to break the inflammatory cycle aΒociated with obesity Hill's™ Prescription Diet™ has a wide selection of clinically proven nutritional products which meet your pet's specific dietary needs. Hill's Evidence-Based Clinical Nutrition™ uses the most up-to-date scientific research evidence combined with clinical expertise to develop a range of diets which help alleviate your pet's health iΒues. Please consult your vet for further information and specific treatment options for your pet. 100% satisfaction guaranteed: Hills Prescription Diet products are made using only top quality ingredients. They have a delicious taste your pet will love. Hill's are so confident..
Price just £31.99! Click here to buy now!